Added by Bill Bowman on May 15, 2018. Frank Hasner, Dan Sytsma, Karen and Mark Mellillo, left to right, after the donation presentation. The Franklin Food Bank was the beneficiary May 15 of a local firm’s celebration of three decades in business. 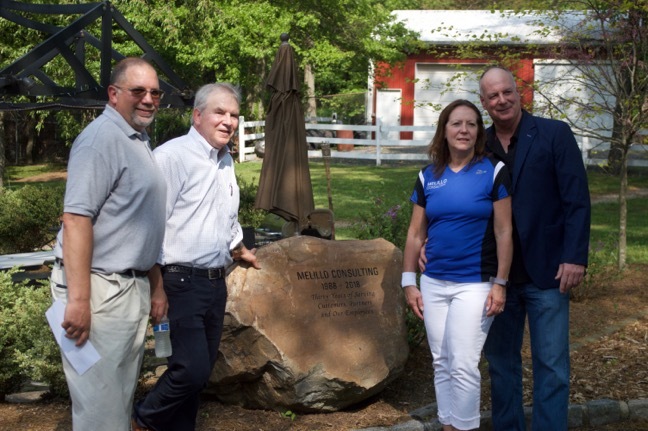 Melillo Consulting, headquartered on Davidson Avenue, held a celebration and check presentation at the Canal Road farm owned by founder Mark Melillo. The farm has supplied thousands of pounds of fresh produce to food bank clients over the past six years. Standing around a large boulder inscribed for the occasion of the company’s 30th anniversary, Melillo, his wife Karen and company president Dan Sytsma presented a $3,000 donation to Frank Hasner, the food bank’s executive director. The money was raised during the company’s kickoff meeting in February, the theme of which was “Winning with a Cause,” Sytsma said. He said a trivia game was played among teams of employees, and the winning team decided to make a donation to the food bank. Hasner said the agency is devising a way to allow its clients to pick their food, much as shoppers do when they’re at a grocery store, rather than have pre-packed packages handed to them. 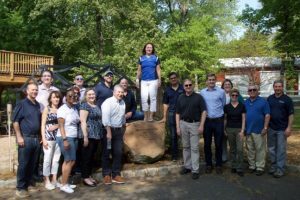 Melillo Consulting employees and executives gather around the anniversary rock. “It’s not just only about what we can get, its about dignity,” he said. Two growing fields on the Melillo property, amounting to about 1.25 acres, have grown about 7,000 pounds of produce just over the past two years, all of which was donated to the food bank. Melillo said he decided to create the mini-farm several years ago, after Hasner spoke about “farmers feeding the hungry” one Sunday at their church, Middlebush Reformed Church. The field closest to Canal Road, measuring about a half-acre, grows sweet corn, he said. A field closer to the main house, comprised of about three-quarters of an acre, grows vegetables. 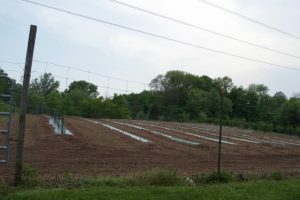 A 3/4-acre min-farm on the Melillo property that grows vegetables. Local farmer Ryck Suydam assists Melillo with some heavy machinery to promote irrigation, he said. Melillo said he also relies on volunteers – arranged by the food bank – to help weed the plots. Melillo, a Hillsborough resident, said he enjoys working in the fields before he goes to work.